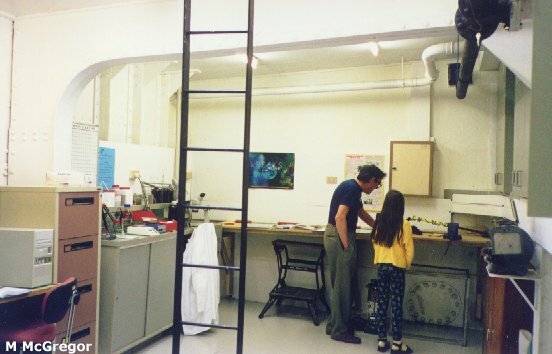 MAANZ had long needed a dedicated conservation laboratory as the cost of leasing space had driven the conservation of artefacts into individual member’s bathtubs, shower trays, basements and workshops. A Wellington Maritime Museum 'Pirate Day' conducted as a part of the annual Port Day, helped provide the necessary site. Acting pirate and MAANZ member Malcolm McGregor, hiding on the historic floating crane, Hikitia, realised the vastness of the space available beneath her decks. The lab idea was born! After some consideration, the building of a conservation laboratory on Hikitia was approved as a MAANZ project. The owners of Hikitia were pleased to provide the starboard, mid-ship hold. Unlit, undecked, with access from a hatch down a vertical companion way, this 7.6m long by 3.8m wide space was everything that MAANZ could have hoped for. An inaugural working bee was held on 31 May 1997 with MAANZ President David Churchill, son Jonathan, George MacDonald, Terry Poynton, Ken Thomas and Malcolm McGregor as the keen team. It was decided to clean, rust proof and paint the bilges, bulkheads and deckheads. The bilges were completed on 1 November 1997 after eighteen very challenging working bees. With both exhaust and supply fans fitted, provided by Conservation Supplies Ltd., the dust-laden air was removed. Even so, helpers at the end of each day, were almost indistinguishable from the rust they were removing! The phrase "rust rats" was well deserved. The bilges were painted in three working bees and work on the decking began on 23 November 1997. Following nine more working bees, the decking was completed. This brought the accumulated voluntary labour to 481 hours. Another six bees and a further 101 hours completed the de-rusting of the deck-head and sides by 2 May 1998. It was decided to install a suspended ceiling. This would provide insulation, control of condensation and a better appearance. Again Conservation Supplies came to the rescue with a supply of off-cuts of polypropylene sheets. The electrical wiring was concealed behind the ceiling, which was completed on working bee number fifty-nine on 31 October 1998 after a total of 922 hours. We now had our own lighting and power. Then followed the process of installing furniture and equipment. 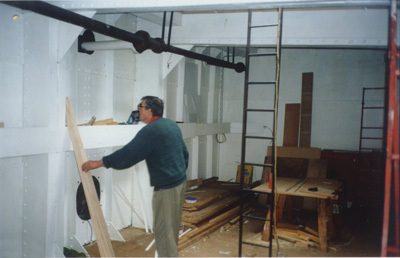 Two swing-away benches were fitted to the aft end bulkhead and a starboard bench and drawers were completed on 3 July. Four port cabinets and the midsection desk and filing cabinet were also installed. The key component that was installed last was the fume cabinet for treatment of metals. This took many working bees and stands as a tribute to the plastic-welding skills of 'Plastics Bob' - Bob McGhan. The original keen team had been complemented by others from the MAANZ membership. Prime among these were Jack Fry, Brian Cropp, Shona McGregor, Evelyn & Gordon Boyce, John Singleton, Wendy Adlam, Brendon Tarrant, David Mason, Rex Johnson and Ken Scadden. All have contributed in various ways.